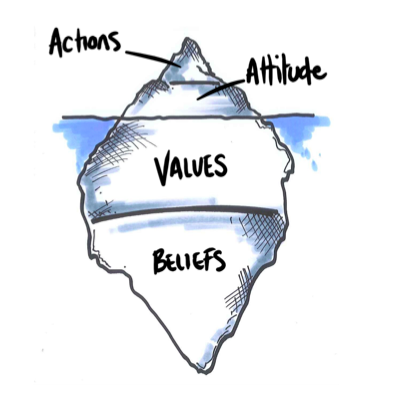 Talk of being ‘values based’ abounds: values based recruitment, values based leadership, values based coaching, values based strategic planning; it would seem that lots of organisations are now doing ‘it’ and that ‘it’ is the thing to do. So that’s great – isn’t it? It is true that every organisation, every group and every human being has values. It is also true that values are highly significant in every decision that is taken, be that individually or collectively. Whether it is a question of what to emphasise in the job advert, which questions to pose in the selection process, who to appoint at the end of the day or whether as applicant to accept the offer of a new job, it is true that our values are playing a pivotal role in which way we go. Is it also true that everyone can give us an accurate explanation of which values are at work in their thinking and how those values have shaped the results that we see? Not so much unfortunately. In these muddy waters we will often hear words like ‘beliefs’ ‘morals’ ‘ethics’ and ‘principles’ being used and jumbled up with ‘values’ which makes trying to understand what’s actually going on very difficult indeed. We have encountered a problem of both meaning and consciousness. The problem of meaning: what are ‘values’ anyway? Academics talk about ‘abstract ideas’ that represent concepts about ideal end states (Rokeach 1979) or desirable behaviours that transcend specific situations (Schwartz 1992). In everyday terms values show up as our personal preferences and priorities, they represent what is most important to us in life (Henderson 2003). Values do have a strong relationship with beliefs which are things about which we are highly certain and so treat as true or real. Based on what we are highly certain about (believe) we prefer and prioritise (value) certain ideas (values) about what to do and how to be (behave) in order to achieve the outcomes we seek. Having clarity about what we mean when we talk about ‘values’, and being specific about what we mean by the values upon which we say we base our recruitment/selection/coaching/leadership, is vital for the whole thing to work effectively. The problem of consciousness: consider this process as an iceberg. This model can be applied to whole organisations, small teams or individual people including ourselves. All that we observe of others (and all they observe of us) is ‘behaviour’ which is made up of what is done – the action – and how that thing is done – the attitude. This piece of our iceberg is above the water line and, in general, is all we have to go to try and understand the bigger picture. From what we see done and the manner in which it is done we form opinions about the nature of that organisation or team or person. What we can not see is the drivers of the behaviour – the ‘why’ behind the ‘what’ – the stuff below the water. Both beliefs and values lie deep within the unconscious. Values are energy laden ideas that sit in the limbic area of the brain where there is no language. The limbic functions in terms of what it feels rather than what it ‘thinks’ or ‘knows’. Together our beliefs and values function as a kind of background operating system. This gives us in internal autopilot sense of how the world works and where we fit in so we can develop our own shorthand ways of navigating everyday events: it would be highly inefficient for example to have to figure out from scratch how to greet colleagues each morning. You have probably noticed in different workplaces there are different rituals for how the morning starts. Some workplaces are quite low key and calm, everyone gets their own individual brew and gets stuck in to the task at hand with apparently very little informal interaction. Other workplaces are noisy and sociable from the moment that two or more people are present, stories are shared and favourite mugs are remembered by whoever is putting the kettle on. Each team of people may have the same belief such as – our work matters and we are here to do our best – but if the teams then prioritise different values as the best way to get the work done well we will observe them behave differently. Our first team might value ‘hierarchy/protocol’ and knowing that everyone from top to bottom has a lot to do and so will not want to distract colleagues attention from the task: internally their behaviour is not seen as rude or cold but considerate. Our second team might value ‘peer support’ and feel that reinforcing the relationships between colleagues first thing makes the rest of day run smoother and more productively so this behaviour is not seen internally as time wasting or joking about but as friendly interest and concern for one another. In theory the model is simple. Our beliefs about the world prompt us to value certain things above other things and in concert these two ‘forces’ drive behaviour. In practice working with the model can be a challenge. As beliefs and values are deeply encoded within our brains trying to put them into words is very hard and if we settle for the first thing that comes to mind it will almost invariably be not quite right as we can’t get down deep enough just by thinking. Fortunately there are other ways to crack the values code. What was the thinking behind the 5 core values for Wellbeing Teams? Academics and psychologists have lively debates about values. Opinions vary about how many different human values exist, what they should be called and how they should be described. There are two things, however, about which everyone in this field agrees. First: values sit in clusters depending on the focus of their attention – so there are for example groups of values concerned with being safe, with belonging, with being productive, with developing skills or with helping others. Second: values sit in hierarchies – which is to say that our brains process them in terms of ‘either/or’ as opposed to ‘this and that’ – values are active in how we make decisions and there are always trade offs between different sought after ideas depending on the situation in which we find ourselves; we can’t hold two or more values as equally important in the same moment so the order in which we present values matters – it matters a lot. Jackie and I spent time reflecting on the values which might most effectively inspire Wellbeing Teams to work in ways that resulted in self management, compassionate care and bringing the whole self to work. We paid closest attention to values that had their roots in positive and confident beliefs (as opposed to fear based or deficit model beliefs). We used the well established Minessence Values Framework as our reference point for surfacing values. We needed to articulate values that made sense when regarded as a set whilst being made up of distinct and relatable stand alone ideas in a sensible priority order. To tackle this task we also had another precious resource: the individual and shared values profiles of one of the Wellbeing team. We were able to draw upon the theoretical framework alongside the real world priorities of people who wanted to do this sort of work in this sort of way; almost a reality check of theory against practice. finding empathetic ways to support individuals and each other to achieve positive outcomes. self and others accountable for actions and attitudes in relation to our shared purpose and values. questions and wondering at the world. without needing to be directed or instructed by others. connection and ensure people choose their own way forward. When you can see both underpinning parts of the iceberg together the expectations of the employing organisation about how to behave – what to do and how to do it – make sense. As we work with 4 new Wellbeing Teams over the next few months, we will keep coming back to these values and beliefs, and exploring how we can make sure that everything we do is rooted in them.